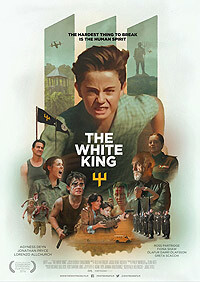 The White King (2016) - Sci-fi-central.com. UK / Germany / Sweden / Hungary  2016  89m   Directed by: Alex Helfrecht, Jörg Tittel.  Starring: Olivia Williams, Jonathan Pryce, Ólafur Darri Ólafsson, Fiona Shaw, Greta Scacchi, Agyness Deyn, Ross Partridge, Clare-Hope Ashitey, Derek de Lint, Matthew Postlethwaite, Louis Suc, Jeffrey Postlethwaite, Declan Hannigan.  Music by: Joanna Bruzdowicz. This film was so bad, on so many levels, it was insulting. I'll confess not to having read the source material so it's impossible for me to know how well or otherwise the screenplay had been derived from the (apparently well-received) novel of the same name, but what can be said with certainty is that while the author has read 'Nineteen Eighty-Four' (as everyone should, of course), he's also plagiarised it. More of that later. The cartoon opening sequence which 'explained' the pass we find ourselves at at the start of the film itself screams 'NO BUDGET!' and while that's not a crime, it was so lazily done that immediately I thought of a simpler, equally inexpensive method of explaining the back story: a voice-over with titles, as was neatly demonstrated in 'Escape From New York'. Variants of 'lazy' kept coming back to me throughout. Case in point, the technical aspects of the film. While the cinematography was adequate, the audio jumped between ear-splitting and barely audible; the lighting was also erratic. The direction was incoherent at best and took us down numerous paths of irrelevance, while ignoring opportunities to take the viewer where they actually needed to go. There was no structure that I could discern. The worst offender was the screenplay. Completely lacking in any kind of narrative flow, it struck me as a very lazy piece of work – or incompetent, or a bit of both; take your pick. The ridiculous ending had the imprisoned father being driven from the scene of his father's funeral in an armoured car, with his son and wife running and cycling after it respectively. To what end? What were they going to do had they caught up with the armoured vehicle? The sight of the wife of the imprisoned pedalling furiously on the bike had a certain comedic value, I grant you, but I'm not sure this was the intention of the co-directors. All that was missing from this scene was the music 'Yakety Sax' (a.k.a. the music from The Benny Hill Show). Some of the performances were suspect. Agyness Deyn as the wife was actually quite good, but horribly miscast as the mother of the protagonist, the son – I initially assumed she was the son's big sister. The son, played by Lorenzo Allchurch, did not convince. His grandfather was played by Jonathan Pryce and his part as a 'loyal party man' was phoned in – and who can blame him when presented with dialogue of such poverty? When you compare his performance here with his epic turn in 'Brazil' it's impossible to believe this is the same actor. As to the plagiarism allegation, in one scene we see the son being urged by his grandfather to shoot a cat with a handgun. He's reluctant to do so despite his grandfather's cajoling, but eventually pulls the trigger and succeeds in killing the cat. The point of this scene, as I interpreted it, was to show that under a totalitarian state, results can be achieved if sufficient pressure is applied. This is an unashamed lift from the 'morning exercise' passage in 'Nineteen Eighty-Four' where, when directly addressed by the exercise instructor though his telescreen, Winston Smith is able to touch his toes 'for the first time in years'. How we're not expected to notice this obvious parallel is a mystery. Overall, the film was boring, nonsensical, technically inept and also hamstrung by that appalling screenplay, which came across as if the writer had better things to do. Well, if you're bringing your début feature to an internationally-renowned film festival for public scrutiny then, no, you don't have better things to do. The film's Facebook page trumpets that Ian Rankin tweeted that this film was a 'harrowing and timely story about ideology, indoctrination and the fragility of freedom'. Obviously I disagree with every word, but it's telling that Mr Rankin didn't say if he thought it was any good. Damning with faint praise, I suspect. This film deserves to sink without trace for its laziness, technical ineptitude and audience-insulting 'Oh, I reckon that'll do' leitmotif. EDIT: I was astonished to subsequently learn that TWK had a budget of $2m. In these straitened times, profligacy of this level should be a criminal offence. Review by Tin Tin-3 from the Internet Movie Database. A quiet film with a strong message and a believable story. Chillingly convincing, but too muted to make an impact. An uncompromising vision of a dystopian future. Pretty paint-by-numbers and nothing new. A boy's-eye view on dystopia. An impressive adaptation which is believable whilst wearing a cloak of mystery. It has a premise filled with potential that remains untouched.